Council ripping out shrubs will make air pollution worse. If the Star round table discussion, (Star November 6), on air pollution is to lead to improvements it will require joined-up thinking by the council. Jack Scott, cabinet member for transport and sustainability, highlighted the need to change people’s ‘hearts and minds’. But we continue to see actions that do the opposite. 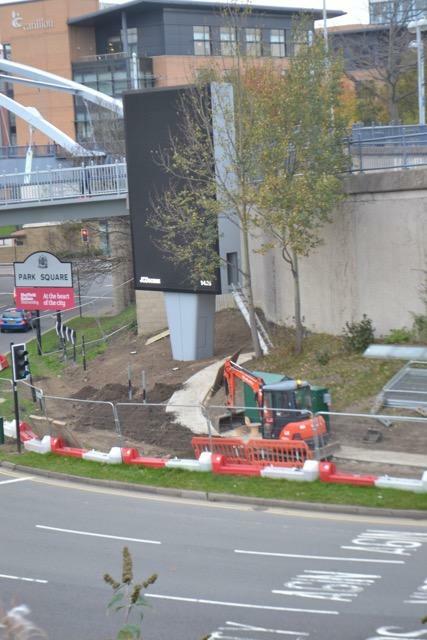 Giant screen on Park Square roundabout that has replaced a lovely silver birch. The shrubs are all gone. I recently went to the Council’s economic and environmental wellbeing scrutiny committee. They were examining a report proposing changes to environmental maintenance services that will reduce clearance of fly-tipping and standards of cleaning maintenance still further. Within those proposals is the removal of shrub beds along many city highways to make grass easier to cut. Numerous studies show that concentrations of nitrogen dioxide and particulates are reduced significantly by well-placed shrubs and trees to remove them from the air. We need to be increasing tree and shrub ground cover in Sheffield, not reducing it. Green councillor Rob Murphy asked for the report to be referred to be reconsidered in consultation with the director of public health so the impact of removal could be assessed. Looking round the table he was the only councillor who voted for this to happen. The report was accepted and the changes will now go ahead. Without thinking through and understanding how decisions made in one part of the authority affect other parts, air pollution will get even worse. And the 500 premature deaths a year in Sheffield linked to air pollution will keep increasing.